Specializing in residential and commercial air conditioner replacement, Air Flex is dedicated to keeping clients in San Diego cool. No job is too big or small, and we deliver 100% customer satisfaction on every project. We offer a wide selection of air conditioner models at affordable prices to meet your AC installation needs. When you work with Air Flex, our trained service technicians will sit down with you and your family or coworkers to discuss your needs and help you find the best air conditioning system for your budget. We pride ourselves on working hard to ensure not only affordability, but quality and complete customer satisfaction as well. So whether you need air conditioner installation for a single unit or an entire office building, our highly trained and experienced contractors will provide the speedy, high-quality service you can always depend on. Call today to learn about our seasonal specials and C system installation options. To make sure your summer vacation is made up of nothing but good memories, be sure to have an San Diego, CA AC repair service look at your unit. If you are hearing strange noises when you turn on your unit., or it just doesn’t get as cool as it used to, give us a call. Whatever the case, the experts at Air Flex can help get your air conditioning unit up and running properly. When it’s time to contact a skilled San Diego, CA AC repair company, the flexible staff at Air Flex is ready to work for you. Give us a call and discover how we can keep you cool. As your cooling system ages, it can lose efficiency and even break, and choosing just any contractor can lead to a costly and prolonged operation. So when you need any service for your Air Conditioning Systems, you can count on Air Flex to get the job done right. Our highly experienced, licensed contractors provide free consultation to help you decide on the best system for you, and we supervise the project along every phase of the process to guarantee quality results. As your heating system ages, it can lose efficiency or stop working altogether. At Air Flex, we provide the highest level of quality in all our installations, and all jobs are performed by highly-experienced contractors you can trust. Call today for immediate consultation from one of our many licensed heating system installation experts. We will patiently answer any and all of your questions and discuss every stage of the process to help you determine your heating needs. 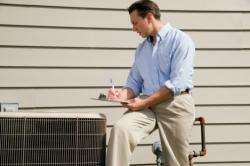 With an HVAC system up and running, a property owner has to ensure that it stays running. At Air Flex, its our job to send an HVAC inspection specialist to homes and buildings across Santee to make sure things are top-notch. Considering the broad range of HVAC systems out there and their intricate mechanisms, only an HVAC inspection specialist will know how and what to look for to make sure everythings running as it should be. If specific repairs are called for, the specialist will know. At Air Flex, our HVAC inspection specialists are taught to heavily develop their attention to detail. When one part of an HVAC unit is even just an iota off, the whole system can suffer. To learn more about our HVAC inspection services, give us a call today.